There are many methods of concrete mix design. But the British or American methods will not be applicable for our country, as the speciﬁc relationships constituting ﬁgures and tables are based on their materials. The IS 10262 recommends procedure for designing concrete mixes for general types of construction using the concreting materials normally available1. The procedure was developed in 1982 based on the experiments carried out at the National Council for Cement and Building Materials (NCBM), New Delhi. The method is primarily based on the basic assumption that the compressive strength of concrete is governed generally, by the water-cement ratio. The recent development of using chemical and mineral admixtures in concrete has not alterted the applicability of the age-old Abram’s water-cement ratio ‘law’, and the compressive strength of concrete is governed by the water-cementitious materials ratio used in concrete. The cementitious materials include cement (OPC, PPC and PSC) and mineral admixtures, like, ﬂyash, ggbs and silica fume. In this paper, an attempt has been made to highlight that in the procedure of concrete mix design, the water-cement (or water-cementitious materials) ratio must be selected from an established relationship between this and the 28-day compressive strength of concrete. Relationships between water-cement ratios or water- cementitious materials ratios and 28-day compressive strength of concrete have been arrived at based on experimental data from different construction sites. Such concrete contains OPC or PPC or PSC or (OPC + ﬂyash) or (OPC + ggbs) and a superplasticiser. These relationships however are for two levels of 28-day compressive strengths of cement, viz. 43- 52 MPa, and greater than 53 MPa. It is observed that these relationships are almost same as given in IS 10262 for two grades of OPC (43-grade and 53-grade). This indicates that the mineral admixtures, like ﬂyash and ggbs contribute to the strength development process at 28-days, similar to that of OPC in concrete. This reinforces the observations made by an independent approach using generalised Abram’s Law for multi component cementing materials13. The relationships can thus be used for selecting water-cementitious materials ratio for the target 28-day compressive strength of concrete containing ﬂyash or ggbs and a superplasticiser. These relationships however cannot be used for very high-strength concrete that is, for concrete having 28-day compressive strength above 80 MPa, using silica fume and a PC-based superplasticiser. 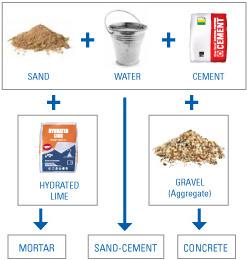 The trial mix design approach is best for selecting mix proportions for such high strength concrete.